I wanted to share with you, Federico Caprilli in the words of his students, Captain Piero Santini and Colonel Paul Rodzianko. The first excerpt is from Santini’s book, Riding Reflections, The Derrydale Press, New York 1932. The second excerpt is from Rodzianko’s book, Modern Horsemanship, Seeley Service & Co, Ltd., London 1936. When the lively and energetic Lieutenant Caprilli was recalled from the small garrison in the South of Italy where he had been sent to cool his heels and his juvenile exuberance after a somewhat hectic debut in Turin, the method which was to make him famous was already clear in his mind. In his exile, owing to his astonishing success in steeplechases and in jumping competitions, he had caught the eye of an intelligent superior officer, and it was thanks to the faith he had succeeded in inspiring in the latter that the young officer — who seems to have had but few partisans of his method at the time — was allowed to demonstrate, to a special committee nominated for the purpose, the practical results of his theories. He presented to the critical and not altogether benevolent eye of his superiors a troop he had been instructing for four months; the result was a veritable triumph, and in 1904 we find Caprilli installed at Pinerolo with carte blanche as to the instruction of the yearly batch of young subaltern pupils. Such was the dawn of what might be called the contemporary era of riding. 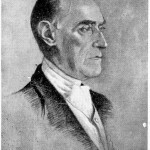 Caprilli was not much given to writing and the little he did put on paper deals more with the rider’s mental attitude towards the horse*—which might he described as one of gentle persuasion as opposed to the forcible methods then in vogue — than with the rider’s actual position as he conceived it. The result has been that, never really having compiled an exhaustive treatise on every detail of his method, most of his principles have been handed down, mainly by word of mouth, to succeeding generations of Italian Cavalry instructors. This has prevented strict standardization and, outside of the Italian Cavalry, has led to a certain misleading elasticity of interpretation which Caprilli’s written word would have done much to keep within bounds. At the time of Caprilli’s appearance on the scene of Pinerolo, horsemanship there, as everywhere else in the world, was based on severe bits and on leaning back at jumps with the feet thrust forward in such a way that the rider was practically dependent on the reins for keeping his seat; and on that most illogical of all theories, “lifting” the horse over the jump by violently jerking his head up — practices which Caprilli condemned as causing discomfort and pain to the horse and consequently disgusting him with his work. 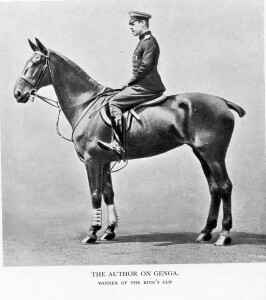 Caprilli entirely suppressed the prevailing methods and based his own on the principle that a horse should be interfered with as little as possible and that, although continually under the rider’s control (he was the sworn enemy of the loose rein), he should move with the freedom and natural balance of a riderless animal — this to apply to all contingencies and not to jumping alone, for the forward seat does not consist, as the amateur is apt to believe, in a jumping formula, but should be understood as a complete and distinct method of equitation. THIRTY years’ experience, and the fact that I have been a pupil of two very great horsemen, gives me the hope of producing a book which will be useful to all interested in riding and training. I studied under James Fillis when he was Director of the Russian Cavalry School in St. Petersburg. Later I worked for many years under Captain Caprilli in the Italian Cavalry School. Since then I have trained horses and pupils in many countries. My main point in this book is to explain the principles of horsemanship evolved by Caprilli. His methods give great importance to the natural balance of the horse. The rider is taught never to interfere with that natural balance and the results are particularly successful in cross-country riding. Polo, Haute Ecole, and Hacks are different matters, for then an artificial balance of the horse is required and James Fillis’s system gives best results. Caprilli was the genius of cross-country riding. James Fillis was a genius of Haute Ecole. My sincere thanks are due to both of them. I have tried to explain their principles clearly. I am also greatly indebted to the friends who helped me to compile this work. This method took into account the build and character of the horse and readjusted the seat of the rider accordingly. Caprilli’s fame spread beyond Italy. Well-known riders came from all parts of the world to see the young officer and study his theories. Caprilli’s work, however, was hampered by serious opposition, for his military commanders refused to accept his ideas. His theories were bound to arouse controversy. At the risk of his military career he continued working. His iron will, unbounded energy, and fanatical confidence brought their reward. The phenomenal success of his pupils and horses won him recognition. Caprilli proved that his successes were due, not only to his own ability, but to his method of training. Even military circles had to admit his authority. Caprilli became Instructor to the Cavalry School. The whole training system was changed by his idea of preserving the natural balance of the horse and harmony between rider and horse. He was planning many ambitious schemes when he was killed by falling from a horse in 1908. The death of Caprilli was an international loss. His pupils are proceeding on the lines he laid down. Caprilli’s system is simple and simplicity is the ideal in all things. Caprilli divided the Italian Cavalry School in two parts: (1) Pinerolo (Savoy), the Headquarters and Junior Section; (2) Tor di Quinto (Rome), the Senior Section. At Pinerolo the pupils and horses are given a preliminary training. The town is very picturesque and the pine-covered hills around provide splendid exercise grounds for the practice of cross-country riding. The Senior Section (Tor di Quinto) is a small cavalry station outside Rome on the left side of the Tiber. Here the pupils who have finished the Pinerolo course are given further training in cross-country riding, steeple-chasing, hunting, &c. The hunting in the Compagnia Romana is very fast and dangerous. The Pinerolo course lasts about one year and that at Tor di Quinto about six months. There is a constant stream of visitors who come to study riding from all over the world. (i) To teach horse and rider to attain efficiency with the least possible waste of energy. 2) To enable the horseman to train a horse for any kind of work. The horse is said to be balanced when energy and weight are equally distributed over his body. He must be able to move in any direction with the maximum speed and the minimum energy. Caprilli taught that the rider’s chief aim must be to respond to all changes of balance by following the movements of the horse. Certain rules must be followed in regard to the rider’s seat. Before Caprilli, the natural balance of the horse was seldom studied. The methods used often went against the animal’s conformation. The position of the rider obviously affects the centre of gravity of the pair. For this reason it is important to realize that a heavy man and a light man should not sit in the same way on the same horse. Caprilli’s training is strictly progressive. Each exercise must be thoroughly studied and understood before passing on to the next. By experience the rider will learn what is meant by change of balance of the horse and he must try to follow it. If the muscles of a young horse are correctly developed, amazing results may be obtained, even from an ordinary animal. The most characteristic point of Caprilli’s method is the lightness and willingness with which rider and horse work together and the calm, easy manner in which serious obstacles are overcome. To prove the above statement it is only necessary to compare a horse trained under Caprilli’s system with a horse of the same type trained in any other way. In these instances it is possible to see the difference between a horse who is excited and strained by his work and one trained to be light and graceful and in harmony with his rider. The uninformed have sometimes criticized the new system on the grounds that it was only suitable for show jumpers. This is a mistake. Caprilli centred his attention on cross-country riding. Jumping must be practised to teach change of balance to horse and rider. If the horses and riders trained under this system excel all others at jumping it is merely the result of correct training.